Recent technological advances have made the longstanding dream of on orbit robotic servicing of satellites a near-term possibility. 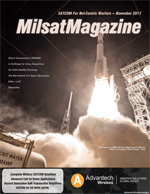 SatCom Frontier Perspectives: The Man Behind U.S. Space Operations, the CIC Program and A Podcast Overview of Space and Satellite Trends, The following articles are courtesy of Intelsat General Corporation and are authored by the SatCom Frontier editorial department. When the U.S. military needs satellite connectivity for any of its operations, it turns to Lt. General David Buck, Commander of both the 14th Air Force of the Air Force Space Command and the Joint Functional Component Command (JFCC) for Space under the U.S. Strategic Command. Light fidelity, or Li-Fi, is a ight ight ifidelity, or Li-Fi, is a ground-breaking light-based communication technology which makes use of light waves instead of radio technology to deliver data.